In contrast the conference yesterday can be seen as far more outward looking, yes the speakers were discussing their research whether it was map-based, archaeological or archival in an academic manner, but the audience was drawn from a wide cross-section of people – from students to academics to members of local history/archaeological groups to teachers to professionals in related fields to members of the public who thought the subject looked interesting. This process of providing first-class new research and analysis through the lens of locality as a means of investigating wider social, cultural, political and other trends and ideas is something that Kent institutions and organisations have done for some time, and is very much in keeping with the ethos of Ian Coulson. I have mention Ian before, so all I’ll just say here is that the Postgraduate Prize in his memory is now up and running at Canterbury Christ Church and hopefully the first recipient will be known by this September. The Centre’s contribution to this long-standing, yet in some ways innovative tradition (apologies for the apparent contradiction) of the dissemination of historical ideas is valuable, as manifest in the number and types of questions put to the speakers in all four sessions yesterday. 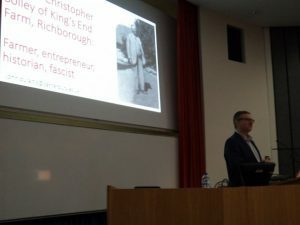 So without sounding as though I am standing on a soap box, and, yes these are my views, I think yesterday, like previous events run by the Centre, showed the vitality of local history/microhistory and its ability to deliver sound, thought-provoking and important assessments that are ‘at home’ in a university setting. So after all that what happened at the conference? Well, in the interests of brevity I will just outline the eight topics discussed during the day. We began with Ges Moody, Director of the Trust for Thanet Archaeology, who through a series of fascinating maps took the audience through what he proposes occurred regarding the formation of the landscape of the east Kent coast, and especially the island of Richborough. Sea level changes are key to understanding much of this development, whether we are talking very rapid rising sea levels following the last Ice Age, or the period of stability which brought (and brings) to the fore matters such as longshore drift and deposition. Furthermore, within the historic past he, like Keith Parfitt who followed him, noted the significance of man’s interference through drainage of the fresh- and salt-water marshlands from the Romans onwards. 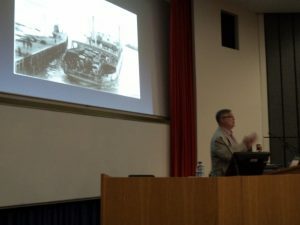 Keith Parfitt, one of the most senior and long-serving project managers at Canterbury Archaeological Trust, concluded the first session by showing the audience what happened when the Trust was commissioned by the Water Board to do a desk-top assessment with limited excavations regarding a pipeline around Richborough Island. As Keith highlighted, the trial trenches brought in nothing beyond the negative of there being nothing there until the archaeologists were just on the edge of the island and going down to low-lying marshlands. Even though this was a preliminary investigation and the main ‘dig’ went to another archaeological outfit, Keith is convinced that they picked up evidence of a spur road and roadside activity in the way of habitation or similar in the Lowton area. However, without the results from the other unit, Keith can go no further, thereby highlighting the problems of piecemeal and disjointed archaeology which means that the larger picture is difficult if not impossible to determine under the present system of project allocation. As a medievalist, I found Dr Paul Dalton’s assessment of Duke William’s march through Kent after his success at Hastings the most interesting. His idea that the reference to ‘the Broken Tower’ where William camped en route to London is actually Richborough sounds plausible, especially as it does make far more sense to have stayed near the coast close to his fleet for a good part of the march before turning inland to use the old Roman road network, but I was even more fascinated by his analysis of the cult of relics and William’s piety, whether for spiritual or political reasons. The links between St Augustine, St Martin and St Pancras, and the men who had particular devotions to these saints offered some intriguing ideas about identity and the role of kingship. Moreover under such circumstances William’s earlier halt at Dover might be added in the same way because of the dedication of the ancient minster in the centre of the town to St Martin. The final paper of the morning and what might be seen as the bridge to the afternoon was the second Canterbury Christ Church lecturer Dr Lesley Hardy. She also evoked the idea of an emotional response to place, which might even be seen to have a spiritual dimension. 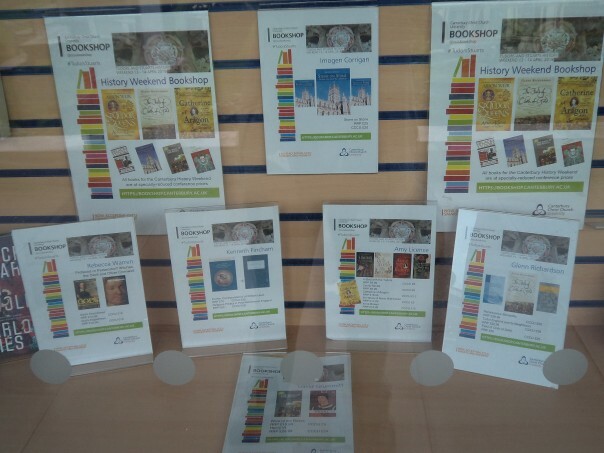 By drawing on the ideas of antiquarians from the 16th century onwards, she explored cultural perceptions about the collapsing of time/place at particular sites in the landscape and how Richborough might be seen in this way, particularly through the novels of Rosemary Sutcliffe and her Roman trilogy. The break for lunch gave people an opportunity to engage in more informal discussions as well as draw breath after a packed and extremely interesting morning. And after lunch the third session brought together Dr Frank Andrews, a well-known Kent historian from Sandwich whose expertise includes the history of the coming of the railways to east Kent. However on this occasion he was, with Dr Martin Watts of Canterbury Christ Church, exploring the rise and fall of Richborough as a vital port during the Great War. The sheer speed and scale of this enterprise was breathtaking and among the information provided was that 19,000 men were accommodated at the port. The port had electric cranes in 1916 and to run such an enterprise had its own power station, there were 3 train ferries and the port was the first to have ro-ro train facilities with a turn-around time of 20 minutes. However things were not always straightforward, and the power struggle to run the port between the War Office and Eastern Command provided Martin with a telling case study regarding how central government, in the form of the Prime Minister, could and did manipulate the country’s war machine. Yet perhaps the picture that will stick in my mind in the story recounted by Frank about the state of the railway bridge over the river where both members of the train crew decided it was too perilous to cross on board the train. The first having got off and crossed carefully on foot, the engineer set the train going forward slowly and quickly dismounted from the footplate to cross on foot behind it (provided of course that it made it), while the fireman was waiting on the other side at which point he nipped back on board to stop it to wait for his companion. Looking at the photograph of the bridge you could see why! The final session took us to ‘Between the Wars’ and first the 4th Canterbury Christ Church lecturer Dr John Bulaitis, who provided an intriguing biographical portrait of ‘Solley of Sandwich’, a pillar of Sandwich town government, a farmer (heavily involved in the ‘tithe wars’ of the early 1930s), a historian, and ultimately a political activist whose place in the history of the British Fascist movement remains controversial. The farm where he grew up and inherited was very close to Richborough, and this sense of place and history and Englishness seem to have come together to influence him in different ways throughout his life. Professor Clare Ungerson continued this theme of the influence of personalities in her talk on the transit camp that used part of the Great War port in 1339/40 to house 4000 Jewish men aged between 17 and 45 years. These men had been brought from 3 concentration camps in Germany due to the work of the Central British Fund for German Jewry and the idea was that they would move on quickly – hence a transit camp. 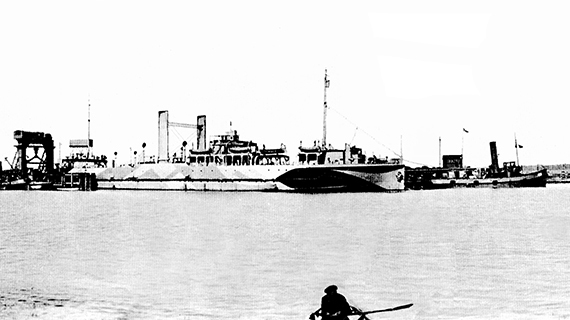 Having briefly described the historical context and the form of the camp, she turned to the relationship between the camp and the neighbouring town of Sandwich, for among the town’s residents at the time were 2 exceedingly rich and prominent Fascists: Captain Robert Gordon Canning and Lady Grace Pearson. Yet, in what could have been a highly explosive situation, things appear to have been managed successfully, although one of the Germans winning at the major chess championship at Margate that year was not one of the intended outcomes. Thus ended a fascinating day and it is measure of the audience’s engagement with the speakers that after the final session there was quite a group gathered around at the front of the lecture theatre who wanted to ask more questions, make observations and offer information of their own. 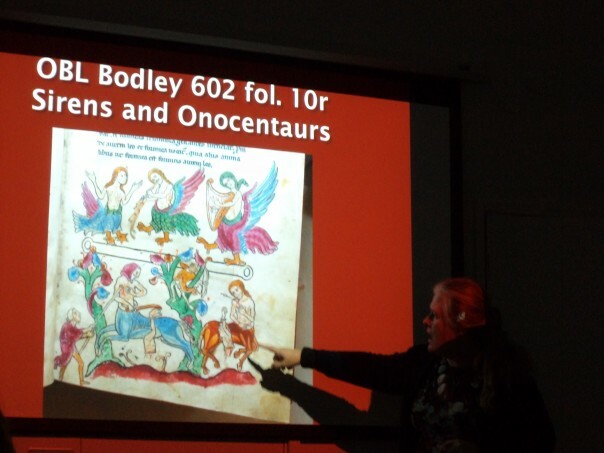 And in the light of this enthusiasm it is worth stating that details of the next one-day conference on ‘Early Medieval Kent’ on Saturday 10 September are on the Centre’s webpage.